This beautiful Italian restaurant is situated some 5 minutes away from Beckenham High Street and offers the discerning customer Italian food at its very best. We specialise in seafood and game (when in season) and many more traditional dishes cooked to order so you are guaranteed fresh produce every time you visit us. Parties are welcome and you can also enjoy a genuine Italian or English wedding menu for that special day. We also cater for buffet parties for up to 60 people and a set menu is available from �12.95. You can also enjoy a traditional English or Italian wedding menu and our manager will be very happy to discuss your requirements. Evening opening times are 6.30-10.30pm Monday to Saturday and Sunday can be booked for special parties. Open Tue-Fri 12-2.30pm (20% off a la carte menu), Tue-Sat dinner 6.30-10.30pm, Sun 1-9pm. All major credit cards accepted (not Amex/Diners). 10% discretionary service charge for parties over 6. 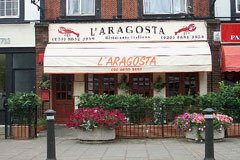 At L'Aragosta we pride ourselves in offering great food and great service. Prices start from as little as �12.95 for a three course meal.